I would like to thank you for always organizing and conducting incredible races. I started running around 9 years ago and my first marathon was the “Florida Gulf Beaches” race. I was so motivated and excited that I continued to race and have completed over 23 marathons and at least 30 half marathons. The detail and care which you and the many volunteers put into your events has left a positive and permanent mark on my life. THANKS for all you have done to make running and walking exciting in Tampa Bay. I have recently moved to the Seattle Washington area and have made new running contacts in the North West……but it will never replace the fellowship and fun I have had in Tampa Bay. I wish you continued success in both your personal and business opportunities….and thanks again for making a major impact on my life and many other runners. With the greatest respect. I would like to thank you and all of the wonderful people that made this race possible! It was one of the best races that I have run! Great post-race party! Thanks again and Happy Holidays! See you next year! Great hospitality and race event, Chris! Once again you and your supporters made it a holiday memory. Thank you for your willingness to organize it and the effort to pull it off successfully. We do enjoy being there! And thanks for the special number with our names on it. How cool! Well, looks like you’ve done it! This race was a success. I must say everything ran smoothly. The weather was perfect, I took my time since I have not been running much and enjoyed the scenery and those I have not seen in awhile, since I do not race much. The FOOD WAS GREAT!! I absolutely loved the meatballs…and I do not even eat meatballs. I told you I had 15…I hope he made plenty. The apple pie was delicious, and I took the opportunity to eat sweets, since I would never buy them. I spoke with other people and overheard others commenting on the food and how well the race was put on. No line for beer and plenty. The set up with vendors and the musician was awesome! WOW! I had to leave fairly early, but this was a race to hang around. I’m glad I came to the race and putting everyone’s name and number of races completed on their number was very special. I know those who received one felt that little touch made all the training and participating worth while. I know I did. I look forward to next year. I’m happy since I beat my last 1/2 marathon time by 3.5 minutes. Look forward to next year’s race. I highly recommend this race! Very fun, scenic, and well organized. I appreciate your hard work for putting these races together. At 48, it keeps me healthy and young in spirit. As usual, I enjoyed so much running in your holiday half. It has become a regular holiday tradition for my running club out of Trinity Y in New Port Richey. It was my 5th. It would be 6th, DUE TO YOUR HARD WORK, if I count running in the Dean Karnazes 42th Marathon, which I participated in and completed. THANKS, for another great race. and, yes, I have already marked my calendar for next year’s race! Gotta run. I had a great time! The event was well-organized; the volunteers were encouraging; and the pasta was excellent! It was my first race after an injury in January and it has definitely got me back into the racing mood. The course is fantastic and there were plenty of aid stations. I also like how packet pick-up on Sunday morning seemed more smooth than last year. I think it helped to have the chip pick-up near the start line, instead of in front of the door. I love this race and recommend it to every runner I know! Thanks. Great race today! We walkers are always on the tail end but we keep going and going just like at the 3 Day! Thanks for all you do! At the age of 60 this was my first race, ever. I truly enjoyed every moment. Your staff and volunteers were exceptional. See you at the next Half Marathon. Thanks for the race in Maderia, this was my very first race and I did it in honor of turning 65, I am female and came in last in my age group, but I finished, which was my goal. Can’t wait until the next one to try and improve my time. Many thanks for making my 65th Birthday a fun one. Awesome race! Had a lot of fun! Thank you for all this huge effort in putting this event together. See you next time! Race was great yesterday. It was my first half marathon and you guys did an awesome job. Will definitely be back next year. Thanks again. Another great race! Had a blast. Thanks. Great run on Sunday.…know it is lots of work for you but it sure is fun for us! Thanks for getting the results posted so quickly. The holiday half was fun, I was one of the angels.” Thanks! I’ve run it 4 times and I will be there next year! Thanks again for all the great races you put together and I look forward to next year! Great job again. We Suncoast Striders enjoyed ourselves at your race. Each year I see great improvements. You are really expanding and that is great to see. See you again next time. Blessings. This was my 6th Gulf Beaches Halfathon and this time, I brought three of my female running partners from the Bradenton Runners Club, one of whom won grand masters and one won second place in the 50-54 age group. The post race party was super with great music and singing and the pasta meal hit the spot! The Pinellas Trail and Taylor Park are perfect venues to stage a race as traffic problems are non-existent. Although the number of runners has increased over the years, the course could easily handle a much larger contingent of runners. A Chris Lauber directed race is always a winner! Congrats on the race. Everything seemed great on my end! Thanks. Thanks for a great race! I look forward to next year. Well I finished and my time may not be one of a competitive athlete but for me; this day was probably one of the best days of my life! I stayed down on the beach so that I would wake up and be local to the event and everything was wonderful. I woke up at 5:30 and started praying that we would have an awesome event and a blessed day! I felt such peace … no nerves at all; just excited! The course was great; toward mile 7 I got very winded and had to walk a few times after that, but all in all; I wouldn’t change a thing! The support; police and bystanders were amazing; I loved the little kids that were standing along the course waiting to “give me five.” I want to thank you; thank you thank you; I can not say it enough! I also had my daughter there who is 27 and she just started to run this year. She finished a step before I did. What a precious and blessed time we had. The pasta was bangin!! Great sauce! I was so grateful that my prayers that the sun not show its face worked! The humidity was killer but I just kept singing with my worship music and God got me through!!! Thanks again! How soon can we register for next year?? It was a great race!! Thank you!! I’m glad I was a part of it! Well organized! That was a great race day. Thanks for all your hard work! Just wanted to thank you for yet another wonderful race! Can’t wait until January! Another highly successful Gulf Beaches Halfathon and our 7th in a row! Thank you again for all you do for the Tampa Bay running community. We had 36 Striders registered and as expected, everyone had a great time. 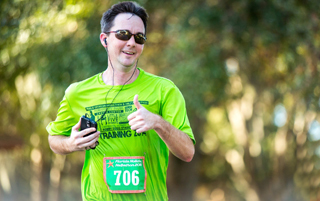 We anticipate at least 10 Striders will be volunteering for your January Clearwater half marathon. Thanks again for your hard work, it does not go unnoticed. Great job on a great race today! I’m thinking of framing my bib number – it’s the best one ever! Had a great race! Many thanks!!! It went well. Great job organizing the race! Thanks so much…didn’t place in my age group…those woman are fast! But had a a great race…thanks to all..from Portland, OR...the humidity was tough! This run ROCKED! Great course; awesomely well planned; good eats! My very first 1/2 and I love that it was right in my backyard….wtg! Congratulations on yet another successful and enjoyable race! I am one of many Striders, who looks forward to it year after year! Thanks so much! This is such a special race for me. I grew up in Seminole so running from Mad. Beach to Largo brings me back. See you next year! Another great race! The best volunteers, good food and a great course! Oh, and one of the most supportive RD’s in the county! Great race! Thank you. This was my first half marathon and I really enjoyed it. This will be an annual event for me now! Thanks again for the great race! I loved the race. Had a great time and set a PR for myself. I had a blast and my friend from Ft. Myers loved it too. I am sorry that I missed meeting you. I limped and waddled around the finish line festivities and through the throngs of finishers and had no idea where to look for you. Everything was awesome. Thanks for all your efforts on this. Wow! Another awesome job by you and your support team. It’s my fourth year in a row, and the race just gets better every year. My friends and I race everywhere, but your race always sets the standard! Thanks again, and see you next year. Kudos to your race director – congratulations on an excellent race. Obviously there was much planning and preparation. This is the first time I have participated in your run. It is one of the best yet! I have completed 21 marathons in the past 4 years. Thanks for all your hard work! Thank you for a very nice race Sunday. The course is great. Scenic. I like how we ran through The City of Seminole Park. Packet pickup on Saturday was smooth. My friend and I took part in the race for the first time yesterday and had a wonderful time. A big thank you to you for a well organized event and an even bigger thank you to all the volunteers who manned the water stations so well. Kind Regards. Thank You for a great event again this year! The bib with my name imprinted will be very special on my Inspiration Wall. Thank You!! I’m already looking forward to the 8th Annual Halfathon. Make it a Great Day. My wife, Jennifer, and I both really enjoyed your race and will definitely be there again next year! This past Sunday was my first Holiday Halfathon. I had a wonderful time and had a new PR of 1:4 8:53 (my previous half PR was 1:59). This half was a big deal . . . especially with my PR, this race was very special to me. First, thanks for the deferral from last year’s half marathon I could not run (due to a torn meniscus). Cheryl took my registration in less than a minute and it was all accomplished. Wow! No PR this year, but I (and my repaired meniscus) did finish with a secondary goal in mind. Second, outstanding support, from the beginning to the end: registration (well organized! ), excellent fluid support on the trail, well marked mileage signs (my Garmin GPS was maybe a tenth of a mile off at the last one), and fantastic support at the end. Third, post race stuff: Pasta was GREAT! I didn’t think I would want pasta at 9:30 AM, but it was hot and delicious! Do it again! The posted race results was a popular place at Taylor Park. I checked back in like 15 minutes and my time was up. Very efficient. I may not do the January half marathon (due to another race injury I have been attending to), but I will have the 2009 Holiday Halfathon marked down as soon as the date is official. Thank you very much for hosting a great race. I traveled from Canada to participate in this race, and it was a great experience. I found the emails prior to the race extremely helpful and the race pick up was very well organized. The morning of the race was very exciting and was easy to find the start line and nice to have an early start for the walkers. The route was well marked and marshaled by the police. The water and Gatorade stations were well manned and muchly appreciated. The route was great and a lively finish line, where they announced my name as I crossed the finish line and received my great medal! The food at the finish line was just awesome and filled the spot. It was also nice to have a cold beer at the finish line. I must tell the race directors in Canada to start this tradition! Thanks again for a great experience… hope to join next year! This was my first half marathon. I usually run 5ks, and I had run only one 10k. When I saw the Fla half marathon and read about it being an end of the year accomplishment, I had to do it. I was told by others to wait and practice running 10 miles for awhile. But I’m not that kind. I have been running 3 – 4 miles, five days a week and working out. I was determined to do this for myself for a Christmas present. And I exceeded my expectations by running the whole way and finishing in less than 2 hours. It was a great planned course and all that was involved in helping make it a success did a great job. I can’t wait ’til next year to do it again and beat my time. Thanks for everything. Fantastic race today! Ran the entire thing with santa hat. Cheers. Let me know any upcoming races in the future. Thanks for a great time and a very well organized half. My son Matt and I wanted to tell you we enjoyed the half marathon again very much! You do a great job organizing it! It has become one of our favorite races to do every year. We look forward to participating again next year as well. Thank you again for a great day! We visited with family in St. Pete after the race and headed back home later that night. We have great memories of a wonderful time! All the best. Thanks for another great day. Everything was perfect. Special thanks for the special race numbers depicting “6” for the number of Holiday Halfathons completed. See you next year to make it #7! My 7th year running, had a great time. Very organized race. Thank you. First, I want to say that I always enjoy the Holiday Halfathon. This was my 4th year in a row running the race and I will likely be back next year. Thanks for another great race! Another great job this year! Thanks for such an enjoyable event. Having my name and the number 6 representing my 6 times running the event was just another plus, great idea! See you again next year. This was the second time for me, I’ll be back next year. Great Job!! I’ve had a training group for Marathon & Half Marathons for the last 8 years. A number of my runners have done your race before, but I always had a conflict. 16 of my current group, and a number of former participants, were all with you on Sunday. WE HAD A BLAST! What a great, perfectly organized, race. All of us are ready to return next year, and we’ll make sure the unlucky ones who didn’t go this year will join us. Next year we will wear striped socks and Santa hats! 🙂 The course was beautiful–loved the park–fabulous feed afterwards and shuttle worked perfectly. There was plenty of food even for the late finishers and those who returned for seconds–and the volunteers served cheerfully! Nearly everyone had a PR. Thank you on behalf of all of us. You have made this my favorite half marathon over the years. It just keeps getting better and better! It’s close enough to Bradenton that I don’t have to take a hotel. The price is right and I love the course, especially the part on the Pinellas Trail and the finish around the lake in Taylor Park. There are a number of places on the course where family members can take pictures and cheer you on. It’s impossible to go off course. Keep up the good work! I’ll try to get some Bradenton Runners Club members to come up with me next year. Just a quick note to say thank you for a pleasurable Half Marathon. The course was fast, and the slight incline afforded by the drawbridge afforded a memorial morning view. The Law Enforcement traffic control was outstanding and all the agencies and the members who worked that day supporting the event should be commended for a seemingly Thankless Job. Their support is appreciated. I can also recommend to my friends who run that this is a well support event and worth the while. Thank you for a very nicely done event. Congratulations on another great race. The course is fantastic and the support from all the volunteers is much appreciated. The post-race festivities with all that great food is really super. I had a great time especially with some of my friends who ran this race for the first time. I love this event! It is very special! Thanks for putting on a super event, very well run and a fun post race party. Loved the music. Thanks again. Thanks for a great race. Thanks so much for a great race! It was a lot of fun and very nicely run. Already plan on doing it again next year. Every year I enjoy myself more. I have not trained a step since July. I signed up early last year to get the greatest discount, but forgot about it till your last email. I figured I would just go to registration and pickup my tee-shirt, you always have a great holiday theme. Sunday morning I said to myself “I can’t let Chris down, he puts so much hard work into his events.” So I showed up at the starting line not knowing what would happen with zero training. I was pleased I finished still standing. I had an awesome time. Weather was as perfect as perfect could be. Lots of water, Gatorade and toilets on the course. The pasta at the finish was really tasty. All the volunteers showed their southern hospitality. And it got my juices going so I’m training for the Clearwater Half in January. Can’t wait! Thanks Chris, you’re the greatest! Thanks for the continued improvement of the race. Overall, a very good race. If you can keep this years race weather around for the next few years, that would be grand. I had a wonderful experience at the 2008 Holiday Half-a-thon! 2. A nice course. (My favorite parts were the last mile or so around the lake and the segment through the shaded neighborhoods. 3. Event was well organized, including starting on-time, which is very important to runners. 4. Volunteers did a great job. 5. Prompt posting of results on the internet. (Heck, I saw my name first in the male 50-54 group which was a nice surprise!) I did not stay for the post-race, as I got very chilled at the finish. My fault. I did not realize that we could have our bags brought to the finish. That was my oversight. Next time, I will do that so I can stay for the food and awards ceremony (which I normally do and is one of the best parts of the experience). Great job! Congratulations and thank you for a well run race. I really enjoyed the race, looking forward to next year. Thank You. Thanks for all the hard work on another great halfathon! This was my boyfriend, Victor Gambone, and my 6 race with you. We liked our special race numbers that we received.